How to Apply for Telangana High Court Recruitment 2019? 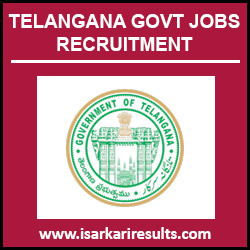 Telangana High Court Recruitment 2019 – Telangana Government has announced Civil Judge Notification again in this academic year. Those who missed out the Civil Judge Exams last year can check the below section and get you to dream destination by this year. Check out all the details regarding the Telangana High Court Vacancy 2019 in this article. The officials of Telangana Government has planned to conduct Civil Judge Exams through Written Examination. Even though it is a written exam application is welcomed through the Online Process. The Online Application is open up from 16th March 2019 and it ends up by 15th April 2019. So those who are really determined about the Telangana High Court Civil Judge Jobs check through the site to gather all the details and apply for the vacancy. Telangana Government has announced a notification regarding the Civil Judge Recruitment. Those who are interested and waiting for the Telangana High Court Notification 2019 can check it here. We have listed out all the necessary and important details regarding the Telangana High Court Jobs 2019 for Civil Judge Vacancy. Around 67 candidates are wanted and they are selected based on the marks scored in the Written Examination. Those candidates who are eligible can apply for the Telangana Civil Judge Notification 2019. Scroll down and gather complete details. As per the official notification released by the Telangana Government for the Civil Judge Vacancies, 2019 candidates should have the minimum educational qualification as that they should have passed out the Graduation in Law from a recognized university. Get all the necessary eligibility details such as educational qualification, age limit, pay scale, selection process, application fee and so on; in the below section for your reference. Below listed educational qualification is must for those who apply for the Telangana High Court Jobs 2019. For Civil Judge Post – Candidates should have done with Graduation in Law from a recognized university in India. For detailed information regarding the educational qualification refer to the official notification. The Age Limit for Haryana Telangana High Court Recruitment 2019 are listed below. The Salary structure for the above posts is listed below. Refer through the official notification to know about the Application Fee. Go for the Official Notification link and download it. Read all the information given in the Official Notification. Then, Click on the Online Apply link provided below. Check out for Civil Judge Jobs. Click on the link and you will enter the section. Fill up all the details asked in the Online Form. Check with the filled details. Hit on the “Submit” button. Take a print out of the completed application for future use. Why Isarkariresults.com for Telangana High Court Jobs 2019? Now you may raise a question that, Why Isarkariresults.com for Telangana High Court Recruitment 2019? Why not others? Here is a solution for you. Here on this dedicated page, we will be listed a complete recruitment process along with Online Application form links. Apart from this, here you can get Syllabus, Previous Papers, Admit Cards & other details once it gets released from the officials of Telangana High Court Jobs under one roof. In Future, if you don’t want to miss any notification released from Telangana High Court, Subscribe to our newsletter or be regular to our page. Hence, Applicants are advised to make use of this article and apply for Telangana High Court Careers 2019-20 Notification.